Halifax boss Richard Marshall said his side’s 20-16 Championship win over Bradford Bulls has “whetted the appetite” for the upcoming Super 8s. A late try from centre Steve Tyrer clinched Fax’s first derby win since the 1998 season - when Marshall was packing down in the club’s front row - sealing a fourth-placed finish ahead in front of 4,589 at a rain-soaked Shay. The competition now takes a week’s break - with the full play off fixture list due to be confirmed by the RFL on Wednesday - before Fax join the Bulls, Leigh and Sheffield in the ‘Qualifiers’ alongside Super League sides Salford, Hull KR, Widnes and Wakefield. “It’s going to be a completely different ball game,” said Marshall, whose side are now on a nine-game winning streak. “The intensity of the whole thing will just go up and up and we just need to make sure we go about our business with a smile on our faces. “This week means a lot to us in terms of our season, but nothing in terms of what’s to come. “We could have thrown that game away and looked towards the 8s, but I think you should field the players you think can win the game. “That’s what we’ve done all year and that’s what we’ll continue to do. “Confidence and momentum are massive in sport; just as much as skill and all those things. “We’ll just go at every game in the 8s as hard as we can. “It was a great atmosphere inside the ground and it gives you an idea of what’s still possible. 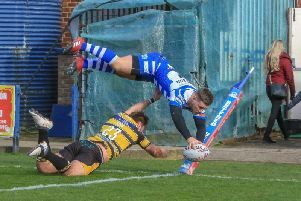 Fax built a 14-0 interval lead with a performance that arguably ranks as their best of the year, certainly in defence, with the veteran forward Richard Moore in blockbusting form. The Bulls stopped the rot early in the second half, scoring three tries to move into a 16-14 lead. “I thought Richard was outstanding; really rolling back the years,” said Marshall, who had seen his side lose from similarly promising positions against the Bulls earlier in the season. “He was a big, big threat to them, a real handful, and he’s played big minutes too. “I thought Dane Manning was superb again; we tend not to mention it because he does it every week but he gets through so much work. “We knew the conditions could work for us if we played it right and we rattled them in that first half; they were spinning round a little bit. “We’ve done that to them before and it was in the back of our minds at half time that they’d come back, which they did and took the lead. “But we came back, bombed a chance, levelled with a penalty and then Steve came up with the try.